I am amazed how many people turn out for the qualifying rounds…why, you ask…because it’s free! Seriously, the week before the Open starts, noteworthy players, who are not having a stellar year, have to qualify for the tournament. During this time, the spectators have the opportunity to see great tennis matches for zero cost, hang around the beautiful Billie Jean King National Tennis Center grounds and also view superstars practicing. This brings me to today’s sightings…Rafa Nadal in all his glory was hitting on Court 4 at the far end of the practice courts during the only break in the weather. 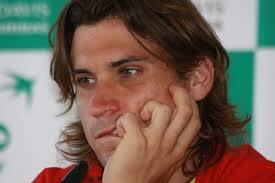 He is one yummy tennis God. I also spotted Roger Federer, but he must have practiced in Ashe which is closed to spectators. His ranking dropped to #7 at the Open. This is his lowest ranking since he was #13 in 2002. Novak Djokovic is #1, Rafa Nadal #2, Andy Murray #3, David Ferrer #4….passed by David today. He is thinner in person and has great hair! Closing out the top 5, Tomas Berdych. The highest rated American is lofty, John Isner at #13…USA men need to represent. USA did pick it up in the women’s draw as Serena Williams is ranked #1. Victoria Azarenka, who defeated Serena last week in Cincinnati, is #2. Sharapova was ranked #3, but is no longer participating due to a shoulder injury. Aggie Radwanska now takes over the #3 position. #4 belongs to Italian Sara Errani who was practicing on Armstrong today and #5 is Na Li. #16 Sloane Stephens is the other top 20 US player. 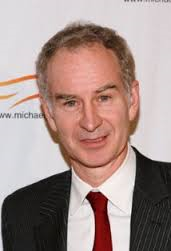 Just before departing the tennis center, my day ended with an ace…I ran into my buddy, John McEnroe, looking dapper in a suit and tie (background music, please… Justin Timberlake’s, “Suit & Tie!) We chatted and then he was off to an interview. I think John is fabulous. Nice reporting, Toby! Do you know that Victoria Azarenka is from Belarus? I do…so glad you continue to enjoy my blog. I hope Vica and Serena meet at the Open…that match up holds great expectations. You were right – they met in the final! Have you seen it live? Yes. I also met Vica. Much prettier in person…very sweet! Right now, Serena is unbeatable. Hope all is well in your world!